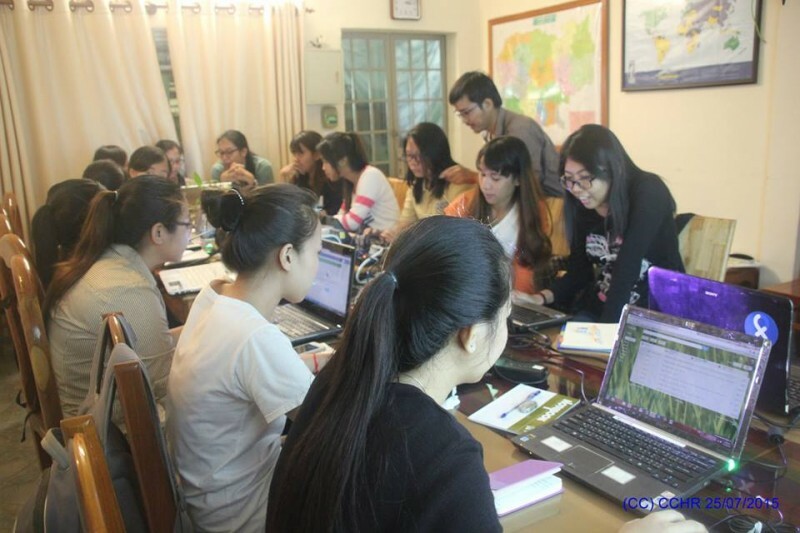 A group of women bloggers in Cambodia conducting a training seminar. Photo from the Facebook page of The Cambodian Center for Human Rights. A human rights group in Cambodia has released a report showing an increase of Internet-related arrests made by the Cambodian government from August 2015 to January 2016. The Cambodian Center for Human Rights monitored seven cases wherein social media users accused of defamation or inciting violence were arrested by authorities. It also noted that 24 Internet users have been publicly threatened since August 2015 because of comments or posts they uploaded on various social media platforms, most especially on Facebook. One of those arrested was a student who called for a ‘color revolution’ on Facebook to reform Cambodian society. Another case involved an opposition politician accused of promoting treason. Although not all of the following cases involve sensible or constructive criticism, they do plainly illustrate a deeply troubling trend, whereby those who criticize the political elite are routinely being arrested for expressing their views on social media. The creation of a culture of self-censorship is particularly worrying in the political domain, as the expression and tolerance of diverse views is essential to maintaining a healthy democracy. The Internet, once Cambodia’s last open and free medium for press freedom and free expression, is now becoming increasingly restrictive and subject to the government controls that have for so long limited the country’s mainstream media. All actions that ruin my honor and my family’s honor, as a prime minister of a country, those must be responsible before the law. If I want to take action against you, we will get [you] within seven hours at the most. Hun Sen has been in power for thirty years already making him the longest-serving leader in Southeast Asia. The release of the report coincided with Hun Sen’s endorsement of Facebook as a mechanism to monitor the complaints and suggestions of ordinary citizens. He even instructed his Cabinet to form special committees to collate the views and proposals made by Facebook users on his official page. Many Cambodians are amused by Hun Sen’s sudden interest on Facebook and even welcomed the chance to interact with the prime minister through social media. But the report of the Cambodian Center for Human Rights is a timely reminder that even if it is interesting to see Hun Sen actively posting selfies on his timeline, it should not distract us from urging the government to be more tolerant of dissenting views.